Can humans use echolocation to hear the difference between different kinds of walls? When we switch on the light in a room, we see objects. As a matter of fact, we see the reflection of light from these objects, revealing their shape and color. This all seems to happen instantaneously since, due the enormously high speed of light, the time that light needs to travel from the light source to the object then to our eye is extremely short. But how is it with sound? Can we “hear objects”, or correctly said, sound reflections from objects? In other words, can we “echolocate”? We know that sound, in comparison to light, propagates much slower. Therefore, if we stand far enough from a large obstacle and clap our hands, shortly after hearing the initial clapping sound, we hear a clear sound reflection from objects – an echo (Figure 1). But is it possible to detect an object if we stand close to it? And can the shape or surface texture of an object be recognized from the “color” of the sound? And how does it work? While echolocation is mainly used as an effective means of orientation and mobility, additional information can be extracted from listening to reflected sound. For example, features about objects’ texture, size and shape can be deduced, and a meaning can be assigned to what is heard, such as. a tree, car or a fence. Furthermore, echolocators form a “map” of their surroundings by inferring where objects stand in relation to their body, and how different objects related to each other. In our research, we focus on some of the most elementary auditory tasks that are required during echolocation: When is a sound reflection audible? Can people differentiate among sound reflections returned by objects with different shapes, fabric or surface textures? In previous work  we showed that by producing click-sounds with their tongue, most sighted people without prior echolocation experience were able to detect reflections from large walls at distances as far as 16 meters in ideal conditions, such as in open field where there are no obstacles other than the wall that reflects the sound, and where one cannot hear any other noises like background noise. Blind echolocators in a similar study , nevertheless, could detect reflections from much smaller objects at nearby distances below 2 meters. 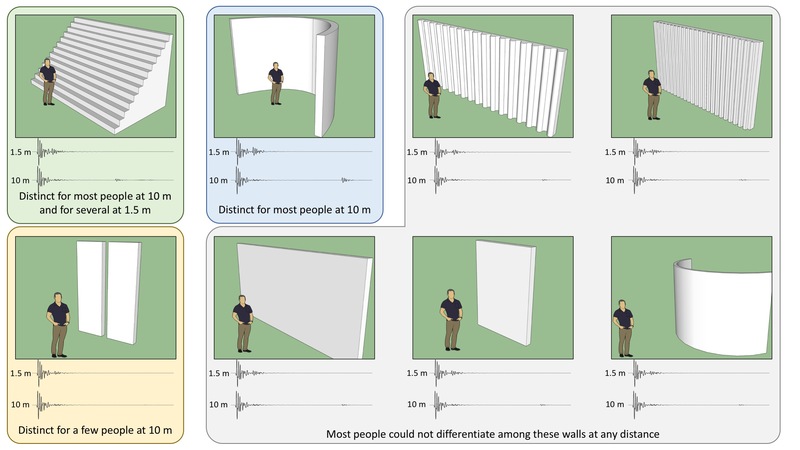 In the present study, we investigated whether sighted people who had no experience with echolocation could distinguish between walls with different surface textures by just listening to a click reflected by the wall. To answer this question, we performed listening tests with 16 sighted participants. We played back a pair of clicks with an added reflection; the first click with one kind of wall and the second with another. Participants responded as to whether they heard a difference between the two clicks or not. This was repeated at distances of 1.5 meters and 10 meters for all possible pairs of simulated walls with various geometries (see in Figure 2 some of these walls and the echoes they produced). We found that most participants could distinguish the parabolic wall and the staircase from the rest of the walls at a distance of 10 meters. The parabolic (cave-like) wall returned much stronger reflections than all other walls due to acoustic focusing. The sound emitted in different directions was reflected back by the wall to the point of emission. On the other hand, the staircase returned a reflection with a “chirp” sound. This kind of sound was also the focus of study at the Kukulcan temple in Mexico . The results of our work support the hypothesis of a recent investigation  that suggests that prehistoric societies could have used echolocation to select the placement of rock art in particular caves that returned clearly distinct echoes at long distances. Rice, C. E., Feinstein, S. H., & Schusterman, R. J. (1965). Echo-Detection Ability of the Blind: Size and Distance Factors. Journal of Experimental Psychology, 70(3), 246–255.